The village of Lake Louise is not that close to the lake of the same name. The lake can be reached by a regular minivan service or by taxi. Lake Louise townsite is, at first glance, a carpark with a few buildings around the edge. However, walking around the area, especially around some of the hotels, can yield good birds. Over three days we saw Western Wood Pewee, White-crowned Sparrow, Bullock's Oriole, Ruby-crowned Kinglet, Dark-eyed Junco, Yellow-rumped Warbler, Brown-headed Cowbird, Gray Jay, Clark's Nutcracker, American Redstart, Violet-green Swallow, Northern Flicker, Pine Siskin and Chipping Sparrow. 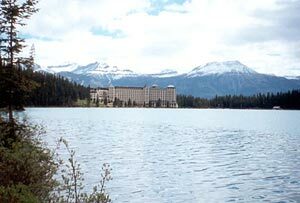 The lake itself is dominated at one end by the Chateau Lake Louise. Again, this can be a very crowded area but is worth a walk around. Paths do lead up into higher areas but we were limited to the immediate lakeside area. This was the only place we saw Steller's Jay, a truly magnificent bird. Clark's Nutcrackers and Gray Jays are common and a colony of Cliff Swallows nest on the Chateau (overlooking the carpark) and the birds are easily seen feeding over the lake, where we saw a pair of Hooded Mergansers. White-crowned Sparrow nests in this area. 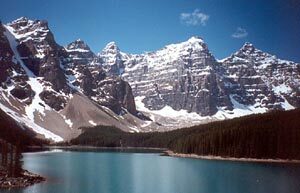 Also reachable by the local van service is Moraine Lake in the Valley of the Ten Peaks. Here we saw and heard Varied Thrush, Bullock's Oriole, American Robin, Golden- and Ruby-crowned Kinglets, Mountain Chickadee, Gray Jay, Pine Siskin and Yellow-rumped Warbler.